In 1961, Srila Prabhupada was invited to make a presentation at Japan's Congress for Cultivating the Human Spirit. He expected that such an audience would appreciate descriptions of nature and think autumn particularly auspicious, so he chose for his subject one chapter from the Srimad-Bhagavatam's Tenth Canto which describes the autumn season in Vrindavan, the place of Lord Krishna’s appearance on earth. For his presentation, he envisioned an illustrated book, juxtaposing Bhagavatam verses with authentic Asian art, to be prominently displayed at the conference. However, Srila Prabhupada wasn't able to attend, and the project was shelved. 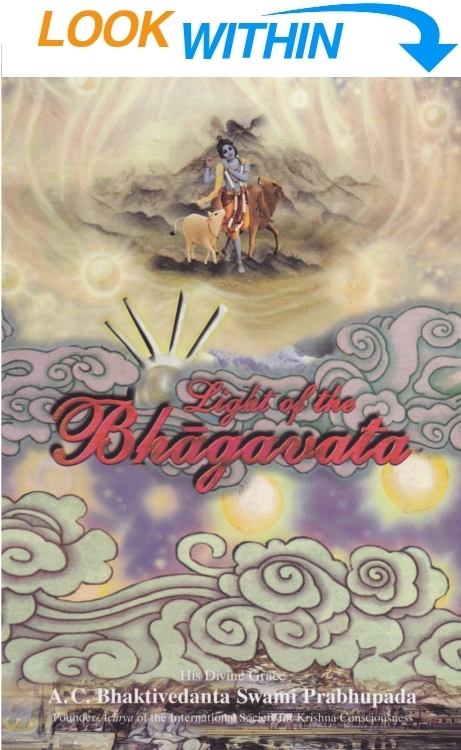 Then, seven years after his passing, in 1984, the Bhaktivedanta Book Trust discovered the manuscript and commissioned artist Madame Li Yun Sheng to create the accompanying artwork for the book Srila Prabhupada had intended to call Light Of The Bhagavata. We offer our respectful obeisances unto the lotus feet of His Divine Grace A.C. Bhaktivedanta Swami Prabhupada, Founder-Acharya of the International Society for Krishna Consciousness, who has delivered the light of the Bhagavata to the whole world. We are pleased to present for his pleasure this publication of his sublime work Light of the Bhagavata. Of all His Divine Grace’s writings, this work is perhaps the most unique. It was written in Vrindavana in 1961 in response to an invitation to attend a world conference, the Congress for Cultivating the Human Spirit, held in Japan. As most of the participants to the Conference were from the Orient, Srila Prabhupada considered deeply how he could best present the timeless teachings of the Srimad-Bhagavatam suitable to the Oriental people. The original Bhagavatam was written over five thousand years ago as an extremely large book composed of eighteen thousand verses. Participants to the conference would not have the time to hear it all. He therefore chose one chapter from the original version for presentation. The chapter he selected was a description of the autumn season in Vrindavana, the place of Lord Krishna’s appearance. Srila Prabhupada knew that the Oriental people were very fond of hearing descriptions of nature and that the time of the autumn season is particularly auspicious to them. Presenting spiritual philosophy by examples from nature would be best for their understanding. For each seasonal phenomenon, a parallel teaching could be given. For example, the dark, cloudy evening of the rainy autumn season when no stars are visible is compared to the present materialistic, godless civilization when the bright stars of the Bhagavata’s wisdom (the devotees and scriptures) are temporarily obscured. Altogether Srila Prabhupada composed forty-eight commentaries to go along with the verses of the chapter. Srila Prabhupada’s plan was that the organizers of the conference should find a qualified Oriental artist to illustrate each verse, and he wrote directions from which the artist could design each painting. He hoped that the paintings and their accompanying explanations would make an impressive display for visitors to the conference. If possible, he wished that there might be published a book containing the illustrations and the texts. Due to unfortunate circumstances, Srila Prabhupada was unable to attend the conference, and the whole project of Light of the Bhagavata was postponed. In fact, at the time of Srila Prabhupada’s disappearance the Light of the Bhagavata still remained unpublished and the illustrations not yet painted. The task of completing this great project was therefore left in the hands of the Bhaktivedanta Book Trust, the publishing house dedicated to keeping all of Srila Prabhupada’s books in print. Particularly, the work was assigned to the Hong Kong branch of the Book Trust, since Srila Prabhupada had meant the book especially for the Oriental people. After much searching it was our good fortune to secure the help of the renowned artist Madame Li Yun Sheng, whose mature creative talent and sensitive brushwork alone could properly complement Prabhupada’s beautiful descriptions of the autumn season. Thus the beautifully effulgent light of the Bhagavata may now shine upon the world. The book has been divided into two sections to accommodate the tastes of different readers. Those who prefer to gaze with poetic imagination will appreciate the first section which contains the beautiful color reproductions of Madame Li’s work, forty-eight paintings completed in less than a year’s time, meticulous in their detail despite her advanced age and sometimes failing eyesight. Undoubtedly, this collection presents the culmination of her long distinguished career as one of the great artists of modern China. Her Gongbi style of painting together with Srila Prabhupada’s poetic descriptions which appear along side make for a unique blending of the world’s two oldest cultural traditions—India and China. Those readers who wish to go more deeply into the philosophy of the Light of the Bhagavata may turn to the black and white section of the book. There they will find the complete commentaries written by Srila Prabhupada along with small miniature reproductions of the paintings to help identify the painting being described. The simplicity, beauty, and intricacies found in nature have captured the minds and hearts of the greatest philosophers throughout time. Even the greatest scientific minds of our time are at a loss to understand nature’s great mysteries. Light of the Bhagavata presents a clear and tangible illustration of the purpose and significance of nature and its origin. Of all the classic works in the vast treasure house of India's timeless Vedic literature, the Srimad-Bhagavatam is the most sublime and precious, for it embodies the essence of spiritual truth in beautifully poetic passages. Within the Tenth Canto of this incomparable masterpiece is a description of India's rainy autumn season as an extended metaphor to illustrate various aspects of transcendental wisdom. For example, the cloudy skies of autumn nights, which obscure the moon and stars, represent the materialism of the present age, which hides true wisdom from the human mind. When in 1961 His Divine Grace A. C. Bhaktivedanta Swami Prabhupada was invited to attend the Congress for the Cultivation of the Human Spirit in Japan, he conceived of presenting the Bhagavatam's description of autumn through a series of paintings and accompanying text. He would title the work Light of the Bhagavata. Selecting forty-eight verses with high visual impact, Srila Prabhupada prepared detailed commentaries to the verses, as well as notes to guide artists in painting the images. When he discovered he would be unable to attend the conference, he set aside the work on the project. Eventually some of Srila Prabhupada's students, recognizing the literary and artistic importance of Light of the Bhagavata, commission well-known Chinese artist, Madam Li Yun Sheng, to execute the illustrations as Prabhupada had conceived them. These exquisite paintings now appear in this volume along with the original text. In Light of the Bhagavata, Srila Prabhupada's evocative prose and Madame Li's graceful paintings in the classical Gongbi style combine to provide a fresh and revealing insight into the vital and enduring truths of the world's oldest spiritual tradition.